Spring Training – Pilates can get Guys in Shape! 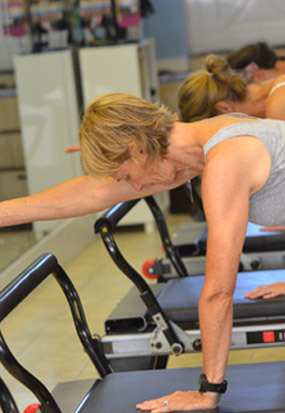 In spite of the incredibly fast growth of an interest in Pilates over the past decade, many still are laboring under the impression that Pilates is for women. This false assumption may have been fueled by the fact that women were the first to accept the “new” workout en masse, but in actuality Pilates was always a workout suited to both male and female physiques. Joseph Pilates developed Pilates for the rehabilitation of men wounded on the battlefield. He was a boxer, a gymnast, and a circus performer, and his entourage was full of male practitioners. His wife had many connections in the ballet community, and they tutored a wide range of students from all walks of life. Today, science has found that Pilates is one of the safest, most effective workout for rehabilitative purposes, since it gently adds function, strength and flexibility to so many different muscle groups and joints. Pilates is used by physiotherapists and doctors, but it is also popular with coaches in all kinds of disciplines. Soccer, football, baseball, hockey, golf, rugby, and more “manly” sports are a perfect place to apply Pilates, as are hiking, cycling, running, swimming and tennis. Male performers such as dancers, actors and more also find Pilates to be a terrific way to discipline their bodies and tone their appearance. Boys can start Pilates at a young age, and should be encouraged to see it as beneficial. Boys often start sports earlier than girls do, despite the fact that they mature more slowly. Extra strain on muscles and joints and bones can lead to injuries, Pilates training can help prevent injuries and make unavoidable damage heal more quickly. Mature men can use Pilates to keep their bodies looking, feel, and performing like that of a younger man. Pilates core training encourages proper muscle use, helping avoid microscopic tears and scar tissue, which can limit flexibility, It can also strengthen the back, an area most prone to breakdown. Consider signing up for a Pilates class, You’ll find it far from womanly –in fact, the workout may have you startled and struggling to keep up for the first few sessions – it’s not a mild routine by any means.